The Asia-Pacific electrosurgical devices market size is estimated to grow with a CAGR of 10.4% during the forecast period. The growth of the APAC electrosurgical devices market is attributed to the surge in rate of chronic disorders, geriatric population in countries such as Japan, China, and others, and volume of surgical procedures. Emerging economies, which include China, India, and others are estimated to create new opportunities during the analysis period. However, stringent government policies limiting the Asia-Pacific market for electrosurgical devices. APAC electrosurgical devices market analysis is done on the basis of product type, application and country segmentation. 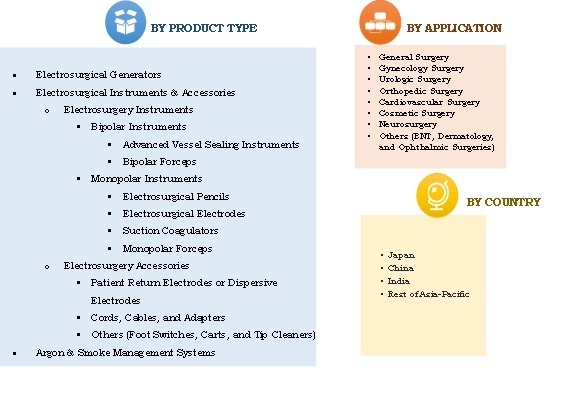 Electrosurgical instruments & accessories is the top potential target market for investment for the key players in the electrosurgical devices market, and its demand is expected to increase owing to rise in the surgical procedures and the adoption of electrosurgical devices in all types of surgical procedures performed across Asia-Pacific. By country, Japan accounted for the largest share in the Asia-Pacific electrosurgical devices market in 2015. The growth is mainly driven by the emerging economies and increase in investment in the healthcare sector. The growth of the electrosurgical device market is estimated to be catalyzed by opportunities in untapped, emerging markets with high potential due to improving healthcare infrastructure, unmet healthcare needs, rise in chronic diseases, and increased demand for minimally invasive surgeries. The healthcare industry in the Asia-Pacific is developing at a significant rate due to augmentation in demand for better healthcare services, significant investments by government to improve healthcare infrastructure, and growth of medical tourism industry in emerging countries. The increase in trend of medical tourism in emerging economies in Asia-Pacific such as China, India, Brazil, Mexico, Malaysia, Thailand, Singapore, and South Korea offer high growth opportunities for electrosurgical equipment manufacturers. However, some of the Asian countries including India are very popular because of high-quality care with remarkably lower costs. Thus, India's medical tourism market is accounted for nearly 3 billion in 2015 and is anticipated to reach $8 billion by 2020. Increase in partnership amongst various healthcare centers at a global level will increase medical tourism globally and it will also stimulate the market of electrosurgical devices. Therefore, surging partnership will create new opportunities in this sector. Hence, the booming medical tourism industry in the Asia-Pacific region, improvement in healthcare infrastructure, increase in healthcare expenditure, and rise in demand for surgical procedures from large pool of patient population in countries such as China & India is projected to create new opportunities during the forecast period. The study provides an in-depth analysis of the Asia-Pacific electrosurgical devices market with current trends and future estimations to elucidate the investment pockets in the market. The report provides a quantitative analysis from 2014 to 2022, which is projected to enable the stakeholders to capitalize on prevailing market opportunities. Extensive analysis, by product and application, helps understand the various types of products used for different applications. Key market players within the market are profiled in this report and their strategies are analyzed thoroughly, which predicts the competitive outlook of the Asia-Pacific electrosurgical devices market. 7.5. UTAH MEDICAL PRODUCTS, INC.
7.8. JOHNSON AND JOHNSON PVT. LTD.
7.10. MEGADYNE MEDICAL PRODUCTS, INC. 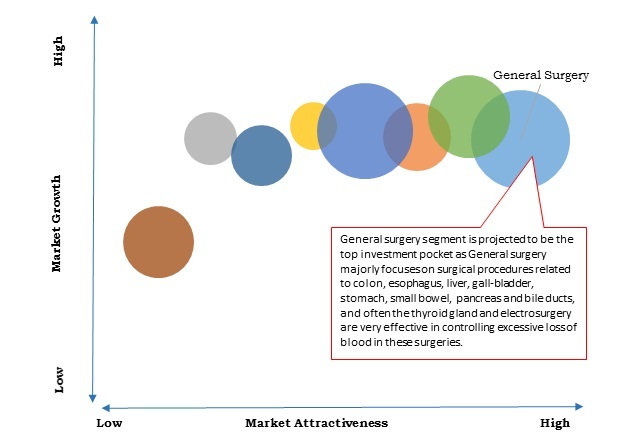 The major factors that drive the growth of the electrosurgical devices market in Asia-Pacific region include surge in geriatric population in countries such as Japan and China, growth in per capita income in many countries in the region, government initiatives for the improvement of healthcare sector, and rise in focus of leading manufacturers on expanding their geographic presence in the emerging APAC countries to capture high growth opportunities in the market. In addition, rise in trend of medical tourism in many countries of Asia-Pacific region owing to low cost surgeries in the region is expected to drive the electrosurgical devices market growth during the forecast period. For instance, according to the press release by MHTC in April 2013, the country’s healthcare tourism market was increased by 51% in terms of revenue between 2010 and 2012. Similarly, there was an increase, by 63%, in the number of foreign patients, who visited the country between 2010 and 2012, for treatment. Japan dominated the market of electrosurgical devices in 2015 due to the high adoption rate of minimally invasive surgeries, rise in geriatric population, and well-established healthcare system in the region. Major companies involved in the production of electrosurgical devices market are Olympus Corporation, Johnson & Johnson Pvt. Ltd, B. Braun, and others.